Hey there! So, there's this girl...and I kind of have a major crush on her amazing artistic abilities when it comes to freehand nail art. If you haven't yet, check her out on Instagram, her blog, and Facebook! Ok, now...I was sent this image by a friend of mine with a simple message of "dooooooo this!!!!!" My recreation of Narmai's gorgeous fall mani! 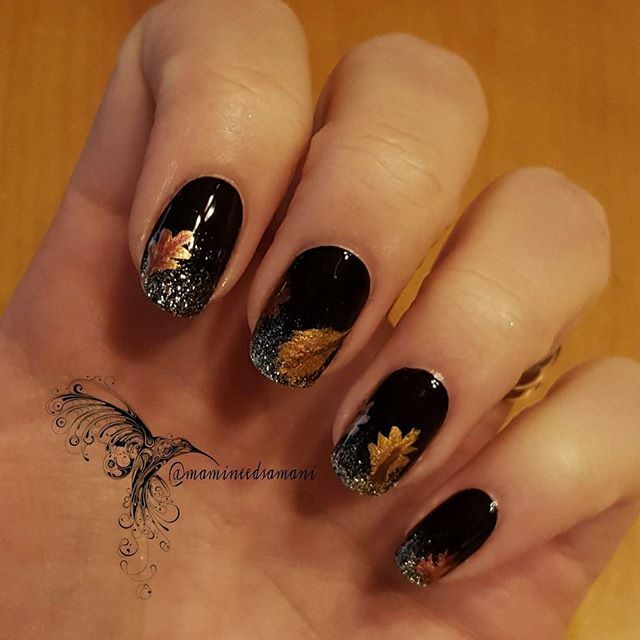 What's your favorite season for nail art? You did a great job. Very pretty! I love these so much, you totally nailed it! So pretty! Perfect interpretation! About 200% times better than I could have done for sure! Nice to see some positivity around her mani too. Thank you! You should give it a try. I was terrified to take it on because, well...she's just so good, but I wound up liking how it came out. Beautiful interpretation! I love the metallic leaves. Christmas is my favourite season for nail art! I think you did a fantastic job recreating this look! Narmai is superhuman! Thank you! Yes, yes she is! Haha!